A critical piece of any waterproofing system is the sump pump. Regardless of the waterproofing system installed, if the sump pump fails, there will be water in the basement. The sump pump is the heart of all basement waterproofing and the final stage in evacuating water from your basement. 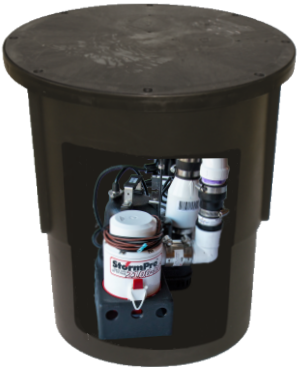 The Champion Sump System features the most reliable pump on the market. The Champion Sump Pump is trustworthy and efficient. It will out-pump most major sump pump brands, while running on about half the electricity. The Champion Sump Pump is uniquely designed so the float switch will not get hung up in the sump basin and runs very quietly. Our Champion Sump Pump is a 1/3 hp cast iron pump. It’s one of the most energy efficient pumps on the market without sacrificing any pumping capacity. The 1/3 hp Champion Sump pumps 2,400 gallons of water per hour, at a 10’ head, while drawing only 4 amps of electricity. Competitor pumps draw 9-10 amps of electricity. The Champion 1/2 hp pump is also available for high water conditions that require increased pumping capacities. The 1/2 hp Champion pumps an incredible 4,200 gallons of water per hour at a 10 foot lift. It can pass up to 3/4 inch solids and runs on an energy efficient 8.5 amps of electricity. After years of trial and error we have found quality, time-tested sump pumps and water pumping equipment to assure a dry basement for customers. Our primary Champion Sump Pumps are truly the champions of the industry. With the two flap silent check valves, it eliminates water flowing back down the pipe and slamming the check valve shut. The check valve is designed so it can be easily removed to replace the sump pump if necessary. Our sump pump basin is built strong structurally with very stiff basin walls and has a wide flat bottom for easy sump pump installation. The Sump Pump Basin is available in either perforated or unperforated. The perforated Sump Pump Basin is surrounded with stone to allow hydro-static pressure from under the floor to enter the sump basin more quickly. For sandy or iron ochre conditions, the basin is also available in a non–perforated model. The Sump Pump Basin Lid has a rubber gasket so there is an airtight seal between the barrel and the lid, protecting homeowners from dangerous gasses such as radon. The sealed lid is also very sturdy – holding up to 250 lbs of weight. A strong lid will keep young children or animals from falling into the sump pump basin. 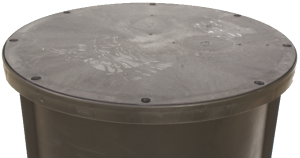 An option for 18″ x 22″ sump pump basin lids is the Half Clear Lid. Half of the lid is clear to allow homeowners to see inside without having to lift the cover. 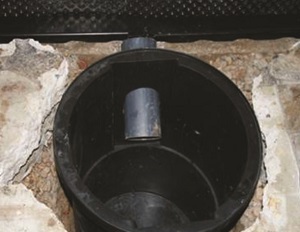 The Radon Sump Adapter is designed to be used with an installed sump basin. 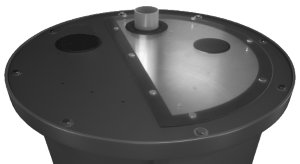 The Radon Sump Adapter will create a radon gas-tight seal around the existing sump basin and can be used with the half clear or solid 18″ x 22″ sump basin lid covers. The Champion Sump System is not complete without an underground sump pump discharge line. Your sump pump discharge line can be buried underground and directed away from the house. 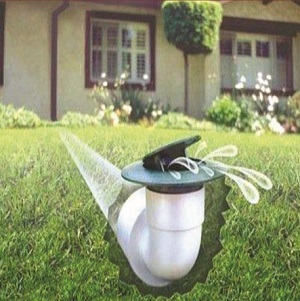 The water expels out of the Sump Pump Discharge Line Pop-Up – a flip top bubbler pot that blends in perfectly with the lawn. The Sump Pump Discharge Line Pop-Up accepts 3″ & 4″ black solid corrugated drain tile pipe. Not-perforated is recommended so it does not break during freezing weather. The Champion Sump System wouldn’t be complete without a battery backup sump pump. It is extremely important to have a battery operated pump in the sump liner in case of mechanical failure or a power outage. The StormPro 2100 Battery Backup Sump Pump is a strong, reliable 12 volt DC power backup option for your Champion Sump System. 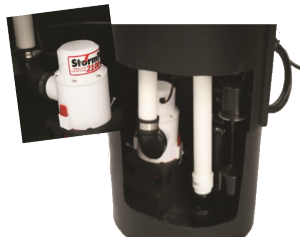 With a high quality, maintenance free battery, the StormPro 2100 Battery Backup Sump Pump will pump up to 11,000 gallons of water on one full battery charge. It can pump up to 2,100 gallons of water an hour with its heavy duty motor. Two next-door neighbors installed the exact same waterproofing system – one put in a battery back-up sump pump and one did not. A few years later a tornado came through town and the town lost power. Greg received two phone calls after that storm… the neighbor who did not purchase (but was offered) the battery back-up sump pump was very irate as their basement flooded when they lost power. The neighbor who invested in the battery back-up sump pump called to thank Greg that he recommended for him to purchase the battery back-up pump as his basement stayed dry. You will not find a more reliable 12 volt DC backup pump system to secure that your basement will stay dry even under the harshest conditions. A high water alarm is the last line of defense in alerting homeowners of a potential problem before disaster hits. The high water alarm is sometimes also called a sump pump alarm. The high water alarm does not pump water, but warns homeowners that there is an issue with their sump pump(s) as the water level in the sump basin is rising. The High Water Alarm provides both audio and visual warnings of potential threatening high water level conditions in sump pump basins, lift pump chambers, holding tanks, sewage, agricultural and other water applications. If a high water alarm condition occurs, the horn sounds and alarm light activates. The horn can be turned off, but the alarm light will remain on until the condition is remedied. The alarm will automatically reset once the high water level condition is cleared. Our style of sump pump alarm is powered by electricity and a 9-volt battery. The high water alarm chirps if the battery is going dead. This helps give homeowners peace of mind that the high water alarm will work during a power outage to warn them of a possible sump pump failure.